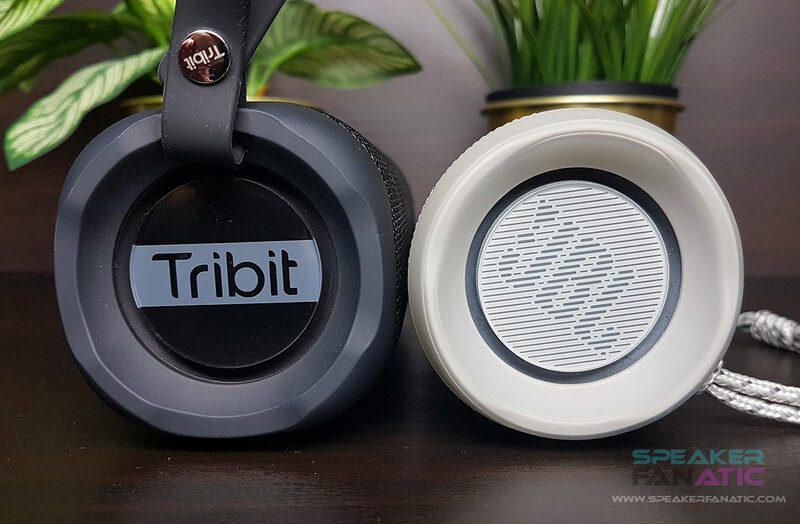 Now, I am happy to tell you that their second speaker the Tribit XBoom is also here and I will do the usual all-inclusive review to find out if it is also a good deal. The Tribit XBoom is a really great device for its price. It has a good battery life and an excellent sound packed into a massive, durable body. The speaker comes in an orange paper box with only a micro USB cable included. While I got the black model and only saw that everywhere, according to the user manual, it is also available in black and red colors. Considering its size and the provided functionalities, the XBoom got a decent price tag which makes it a budget-friendly device. The Xboom is a well built, robust speaker and although, I would not say it is a clone device, in terms of design, it does not bring anything new to the market. 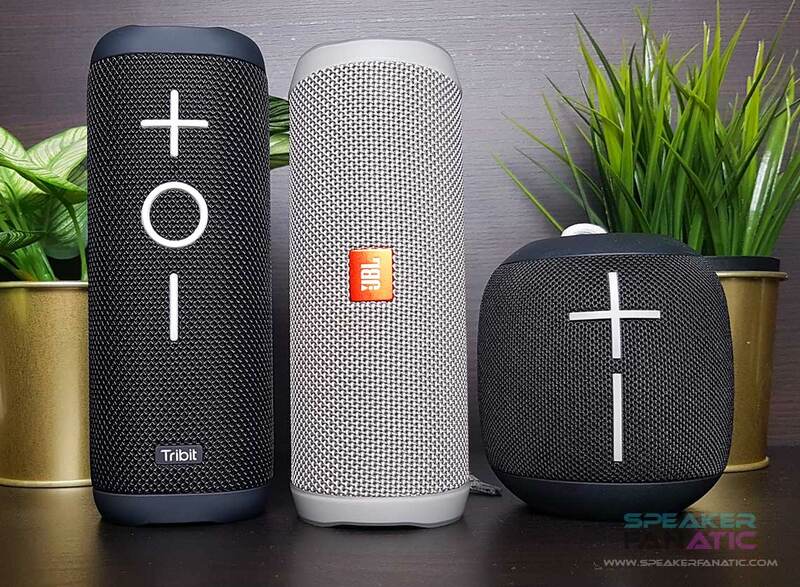 It looks like the lovechild of the JBL Flip 4 and the UE Wonderboom with the same shape and external passive radiators as the Flip 4 and the very similar control buttons as the Wonderboom. Comparing to the Flip 4, it is a bit taller and bulkier but still not too large or heavy to carry around. On the whole, it feels solid and durable just what you would expect from an outdoor speaker. On the front, the speaker got three large buttons: the multifunction button and the two volume buttons. Since they are large, it is convenient to use them even in low light conditions or if you are in a pool. They are also easy to press and clicky enough. On the back, you can find three additional buttons: the power, the Bluetooth and the extra bass buttons. Turning on the extra bass, the speaker gives a slight boost to the lower frequencies. In terms of music control, the XBoom is quite powerful, you can pause/play the music by pressing the multifunction button, you can skip a song by double pressing it and you can jump back to the previously played song by triple pressing it. So you can navigate between the songs just by using the speaker but with more dedicated music control buttons, this could have been made even easier. The XBoom got a built-in microphone, so it can be used as a speakerphone to answer phone calls. Just as you would expect from an outdoor speaker, the XBoom is completely waterproof. It got an IPX7 water protection which means, it can be submerged into 1-meter-deep water for 30 minutes. On the top of that it even floats on the water, so it is an ideal choice for any water sports. To ensure the water protection, the charging and the audio input ports are covered by a waterproof flap. The flap seals well, however, it is not the best design I have ever seen, it is really hard to open, you have to use your nail for it. Regarding attachment options, the XBoom got a small loop on the top, which can be used to attach a carabiner to the speaker or to hang it on a hook. This is better than nothing but it is quite small, the shoelace lanyard of the Flip 4 is more practical since you can wrap it around your wrist. In my outdoor test, I measured around 70 feet Bluetooth range, which is an average range in this category. 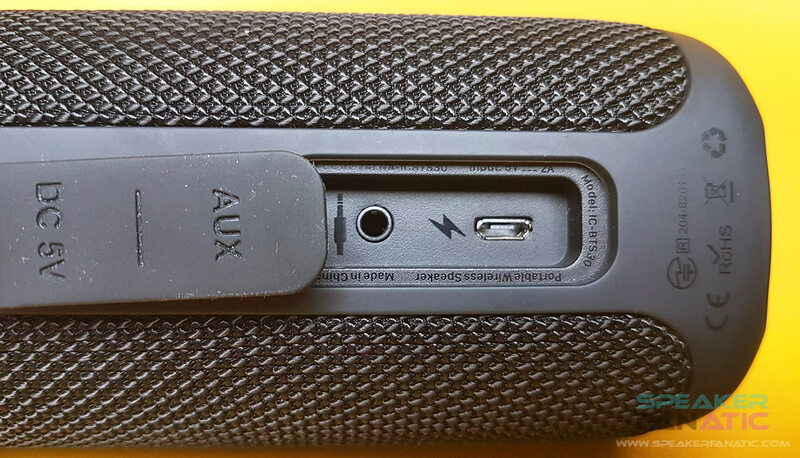 Besides Bluetooth, the speaker got an audio jack input port so you can also connect it via an audio cable. On the top of that, if you have two XBooms you can connect them together for an amplified sound. The XBoom got an 5200mAh battery which is a quite large one considering that for example the JBL Flip 4 comes with a 3000mAh battery size. In my test when I played various types of songs on the speaker at 70% volume, I measured 8 hours play time while repeating the same test at maximum volume I got 4 hours. This is a pretty good battery life, better what similarly sized speakers like the JBL Flip 4 or the Sony XB21 can provide. However, it is not outstanding considering for example that the Anker Soundcore 2 can play for 8 hours at max volume. It is nice that the XBoom has battery indicator LEDs, which show the battery level in four steps but again design wise it looks like an exact copy of the JBL Flip 4’s battery indicator. 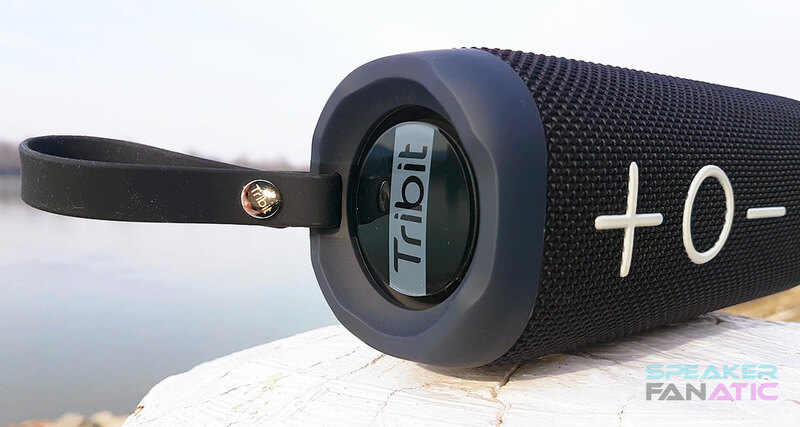 The first Tribit speaker achieved its success thanks to its excellent sound and cheap price. And fortunately, it seems Tribit could repeat its success again since sound wise the XBoom will also not disappoint. It has a nice clear sound with pretty powerful lows and bass. Its sound is rich; the highs could be little bit brighter but overall it has an excellent sound. I think it sounds even a slightly better than the JBL Flip 4. One issue I have to mention here, that when I watched videos with the speaker, occasionally I had latency problems, so the audio was lagging compared to the video. As I checked it, other reviewers also experienced this problem, so it is not an individual issue of my test device. According to Tribit, this can be fixed with a software update and will not affect the later shipped units. I think the Tribit XBoom is a really great device for its price. It has a good battery life and an excellent sound packed into a massive, durable body. 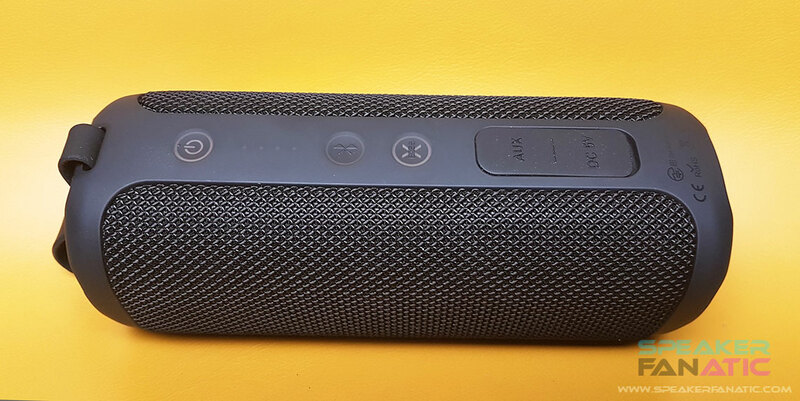 Only shortcomings are the latency problem I experienced but hopefully it is already fixed and the design which is pretty much a copy of the JBL Flip 4 and the UE Boom speakers. However, overall I think the XBoom is a great deal especially if you are looking for a portable outdoor speaker with an excellent sound. The XBoom is highly recommended and besides the Flip 4 it is also a best pick under 100 dollars. One obvious alternative is the JBL Flip 4, which has a similar size and the same design. Another contender in this category is the Sony XB21 which also has a durable body and provides more functionalities, however, it has a quite short battery life.